The CONNOR’S Malaysia Brewery Tour. CONNOR’S Stout Porter, a brew inspired from the 1700’s British Stout Porter recipe, crafted to suit today’s consumer’s taste expectations. CONNOR’S Stout Porter was carefully concocted to deliver its crisp texture, creamy foam and gentle roasty undertones with a unique balance of bitterness and robustness. The tour began at the Carlsberg Malaysia factory, in Shah Alam, where CONNOR’S Stout Porter is made. The mandatory safety briefing and product introduction. 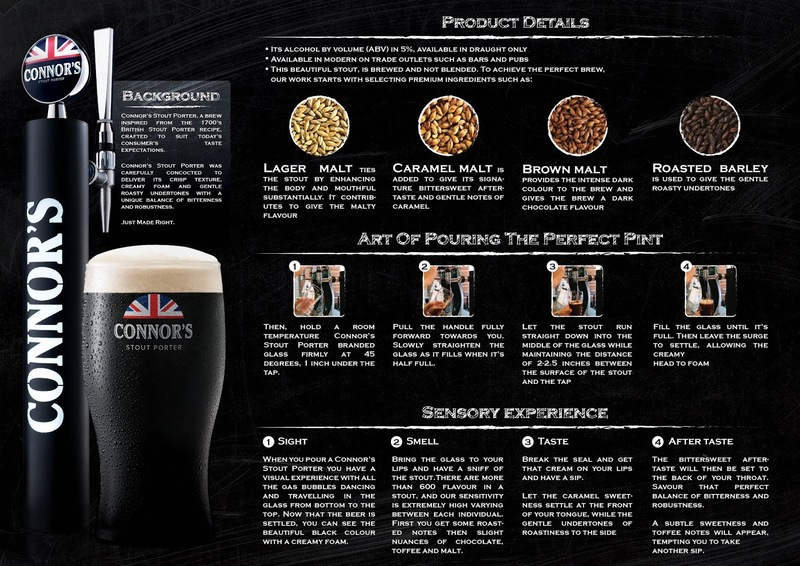 The experience continued with a short lesson on the CONNOR’S Stout Porter Brewing Process.
. It’s alcohol by volume is 5%, available in draught only .
. It’s brewed and not blended .
. It’s premium ingredients include: Lager Malt, Caramel Malt, Brown Malt and Roasted Barley . That’s David, giving us insights into the arduous brewing process, attempting to make each step sound as simple as possible. Why does everything still sound so foreign to me? This is the “Mash Filtering” process, where the final mash will be filtered to produce a clear wort. 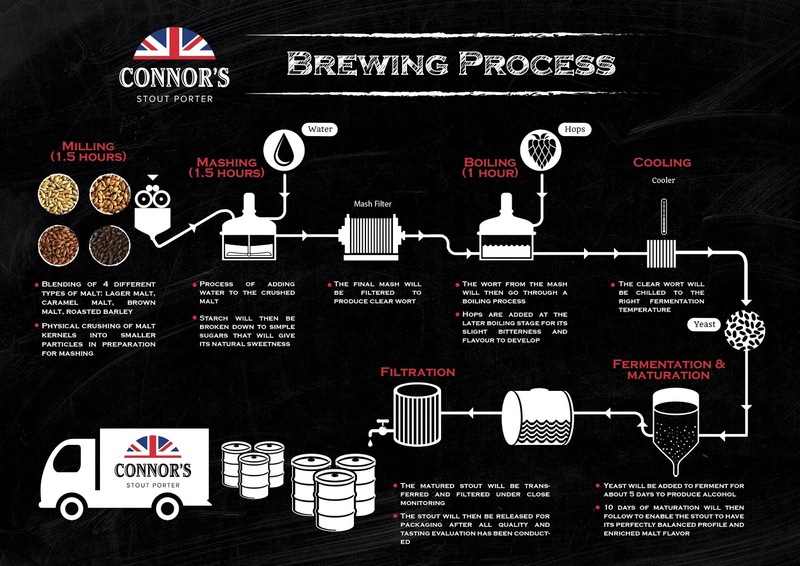 Scroll to the bottom of this writeup for a detailed graphic of the Brewing Process. I tasted all 4 types of malt that goes into making the stout, and this is my favorite – the Caramel Malt – added to give it’s signature bittersweet aftertaste, gentle notes of sweet caramel. 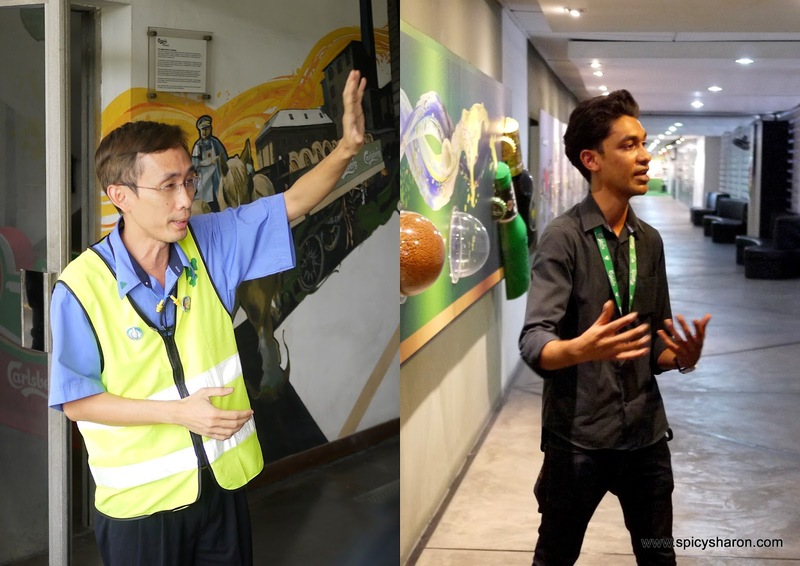 After that, we went for a look inside the brewery, at the Carlsberg Malaysia Brew House. Safety first! Everyone gets their own safety shoes. Mine felt rather uncomfortable to say the least. Without disrupting any of the ‘real work’, we toured only a small section of the brewery, where we got to see the “Mashing” process. This is the part where water is added to the crushed malt. Here comes one of my favorites part of today’s tour. Learning how to pour the perfect pint!
. Hold the glass firmly at 45 degrees, 1 inch under the tap .
. Pull the handle and slowly straighten the glass when it’s half full .
. Let the stout run straight down into the middle of the glass while maintaining a distance of 2-2.5 inches between the stout and the tap .
. Fill the glass until it’s full then leave the surge to settle allowing the creamy head to foam . Alvin Yap Draught Beer Service Manager, ‘the professional’, demonstrating the art of pouring the perfect pint. The team behind CONNOR’S: Gary Tan (Brand Manager), David Bidau (Supply Chain Director), Juliet Yap (Marketing Director), Alvin Yap (Draught Beer Manager). Sight: A great pour always comes with a layer of perfectly done creamy foam, touching the tip of the glass. Smell: There’re more than 600 flavors in a stout – roasted notes with nuances of chocolate, toffee and malt. Taste: A caramel sweetness with settle at the front of the tongue, while the gentle undertones of roastiness will be at the side. Aftertaste: The bittersweet aftertaste will then set at the back of the throat, with subtle sweetness and toffee notes tingling after that. After the tour, we stayed back for some food and drinks, nothing extraordinary, but I was feeling extremely contented with my shrimp and wantons, not forgetting my chilled pint of stout that came with it. CONNOR’S Stout Porter all the way! I also had a fantastic time catching up with my blogger friends, as well as a fun experience learning about the entire brewing process. Thank you CONNOR’S for the great day out. It was Just Made Right.